Our stove in the apartment is powered with gas. We are not hooked in to a city gas line. City gas is available in some areas close to downtown. 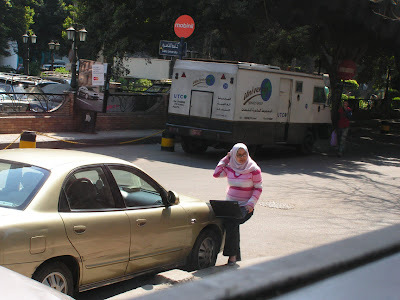 Linda recalls gas lines being installed in the Dokki area back in the late 1980s. 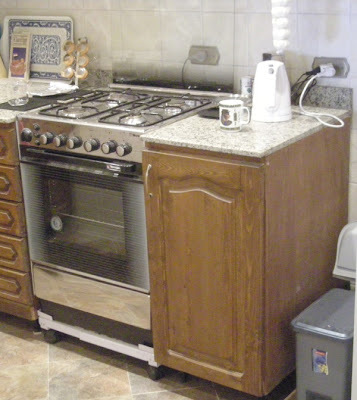 So how does that stove operate? Bottled gas. 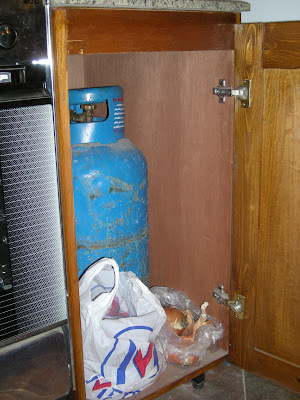 That cabinet just to the right of the stove contains a large blue bottle of gas. That leaves a little bit of space for onions but not much else. I plan to add some shelving in the future though. We only use the gas for cooking. Many people also heat their hot water with it. Gas is generally cheap and readily available. If you need a replacement bottle (known locally as a "bomb") you just let the bawab know. Think of a bawab as a doorman. This New York Times article presents a rather negative stereotypical view of the bawab but gets the idea across. Your bawab will flag down a passing gas salesman. These folks are easily found because they come down the streets banging on their bottles with a wrench and shouting out the Arabic word for the product. The bawab and the seller will exchange "bombs" for you. You settle up the money with the bawab. 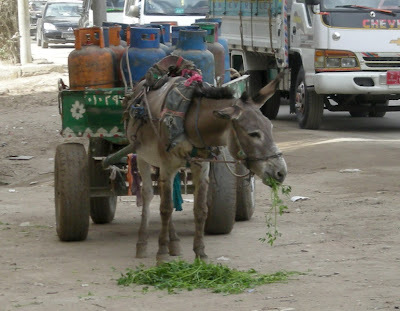 While they work, it's lunch time for the gas seller's donkey. 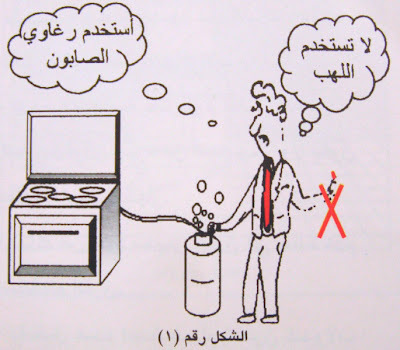 Our stove has an installation manual that I think recommends using soap bubbles to check the connection to the bottle. The manual definitely advises against using a match. I can tell that much from the next picture even without an English translation. Nevertheless, the friend and his bawab who installed our first bottle used the match test. This didn't bother me since my dad used to use the same test back in the 1950s. 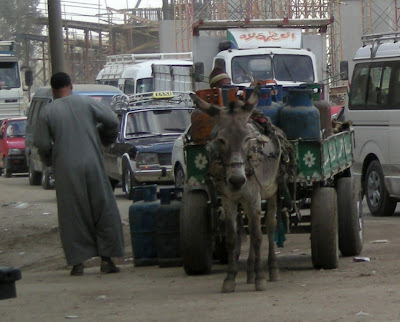 There does not appear to be any odorant added to the gas in Egypt. I suppose that the consequences of opening a burner valve and then not pressing the igniter button on your stove could be quite severe but I don't hear of this happening much. The quest for furniture continues. 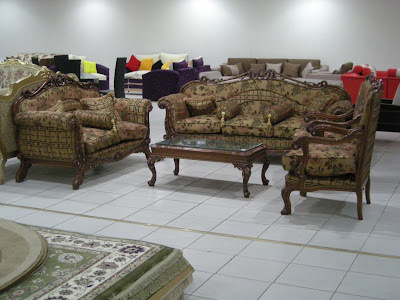 Our custom-made sofa and chairs are being constructed across town in Nasr City. Meanwhile furniture is appearing like magic in the apartment. Friends gave us a carpet and a great entryway mirror. Linda went over to our next-door-neighbor on the floor to ask a question. She came back an hour later pushing a loaned bedside table through the door. That's how things work in Cairo. Linda also had received a recommendation to visit Dary department store on Pyramids Street to shop for accessories. We have been past the building many times and Linda was interested in visiting it even before the recommendation. The elevator opened on the top floor and much to our surprise and my delight, we were in a hardware store. The entire floor was occupied with nuts, bolts, nails, wrenches, etc. I had been planning to go downtown to a street filled with tiny tool stores - it is just a couple of blocks from the street filled with tiny auto parts stores. But no, here close to home was all the hardware I needed. I soon had a hacksaw and blade, two masonry bits, a crescent wrench and a couple of other items. And all for under ten dollars. If you are in Cairo and looking for small tools - Dary is highly recommended. A bit more about Pyramids Street. Obviously it is named because it runs straight out toward the Giza pyramids from downtown. 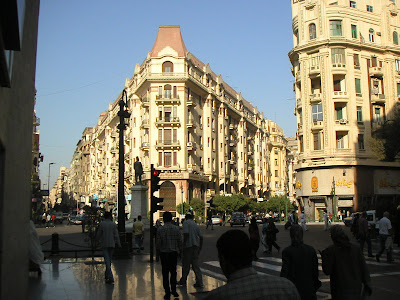 The street is about five miles long running from Giza Square, near downtown, out to the west. 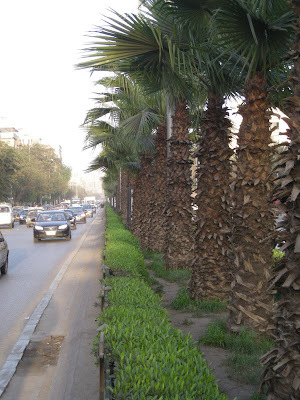 It is lined with palm trees in the center and has heavy traffic at most any time of the day or night. There are shops, restaurants, hotels and much much more along its length. It is always bustling with activity. There are no traffic lights. There are no left turn signals at these non-existent traffic lights. Every half mile or so, you will encounter a "loop back" that lets a driver reverse direction. At those points there are always more than three lanes. We only had a few constuction issues on the apartment project. This is because we had a good friend on site managing the construction. The biggest issue was the height of the upper kitchen cabinets. 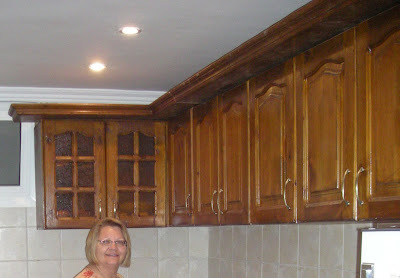 Here Linda is standing by the cabinets. She can't reach the top shelves in them. The overhang with the crown molding also protrudes too far over the cabinetry for our taste. Our friend assured us that they could be easily lowered. Unfortunately, he was unable to get the original carpenter on site to do the job. After about ten days of effort, he decided to go with a different carpenter. One evening, the carpenter showed up with a young assistant and set to work on the job. The work demonstrates some of the differences between the U.S. and Egyptian crafts. Our carpenter didn't bring a step ladder. We gave him a chair to work from. He brought along a cloth bag of tools. These included a screwdriver, a hammer, a square and a handsaw. He did have an electric drill. The job was accomplished with all screws turned by hand and all sawing completed with the handsaw. When the job was complete, everything was as Linda wished. 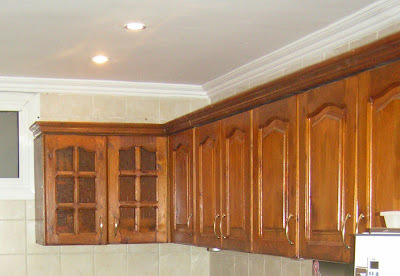 The job took about two hours for the carpenter and assistant and we were charged 150 Egyptian pounds. That is about $27. 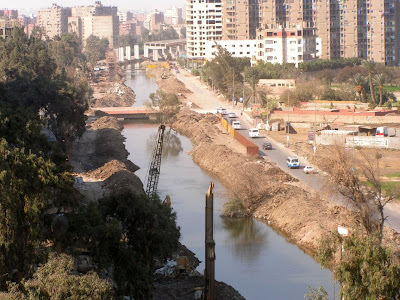 It occurred to me that some of my readers may not have been to Cairo and could use an introduction to the area to help in reading some of my current entries. The red line is the "Ring Road" a 68 mile long beltway that circles the Cairo metropolitan area. With three lanes marked in each direction it moves traffic quite well unless there is congestion - which is frequent. It might look to you like there are a couple of vehicles driving over the sand on the left edge of this picture. Again, you are right. 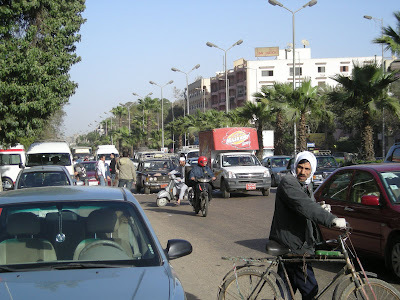 Since the ring road does not go through, Cairo drivers simply drive out into the desert as they head west where the road would have been built. At rush hour, the traffic on this narrow stretch of desert trail is simply unbelieveable. Meek drivers should not attempt it! We have an excellent view of the project as it runs right in front of our apartment building and is scheduled for completion this year. 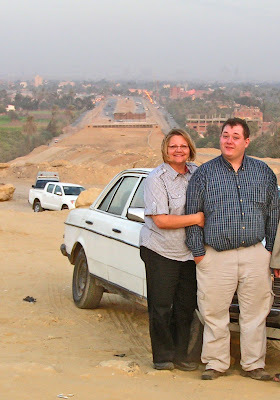 To help you judge the distances on the map, it is about eight miles from the pyramids to downtown and about ten miles from downtown out to the airport. This eighteen mile journey can take anywhere from about a half hour to two hours depending on traffic. Here is a picture taken near sunset of the dust arising from the non-existent extension of the Ring Road beyond its official end. 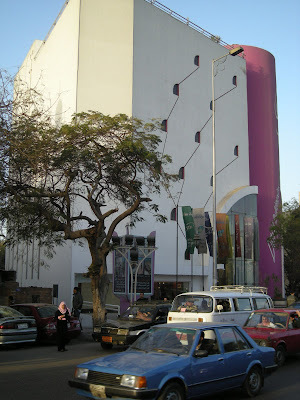 When Egypt was ruled by the British, they built a number of the downtown buildings. 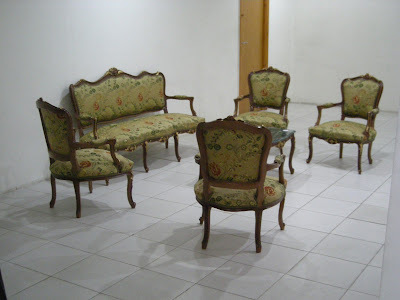 These were painted a standard pale yellow. 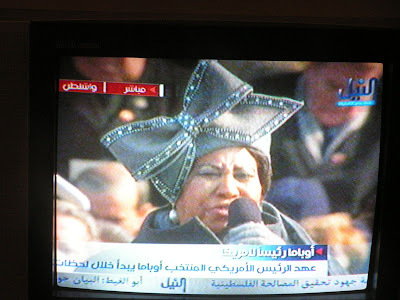 Here is an example of the style as seen at Talaat Harb Square. Appareantly, there is a program underway rejuvenate and standardize more of this color today. 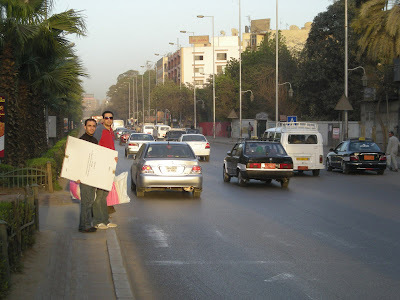 As we walked down one street near the Egyptian Museum, we noticed a little paint splattered on the sidewalk. By the time we reached the corner it was heavily splattered on the sidewalk. This car was parked in the wrong location. 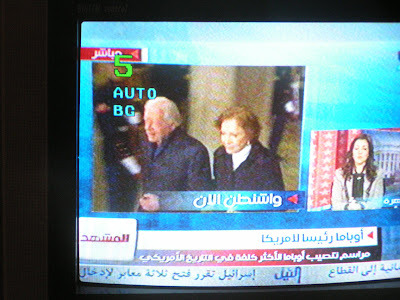 I had hoped to have a satellite dish installed during our first week here in Cairo so that we could watch the presidential inauguration. This was not to be. 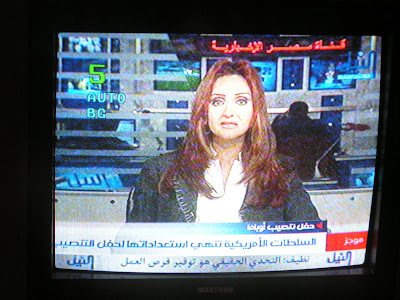 To get some coverage, we hooked our TV into the cable I had pre-wired through the apartment. 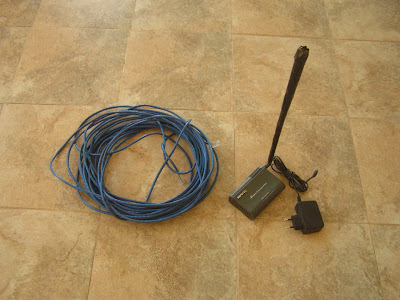 This gave us enough antenna to pull in about ten local stations. 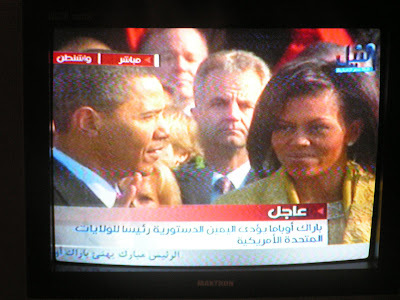 One station, Nile TV, appeared to be ready to cover the inauguration live so we settled back to watch. And she deferred to a pair of "talking heads," one female and one male. The lady appeared to be part of the news operation while the male seemed like an "expert." 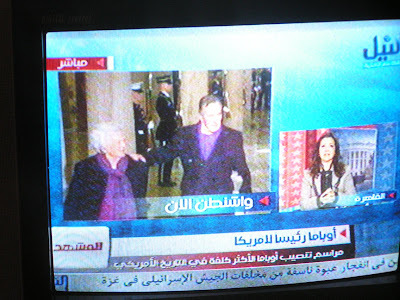 There was at least an hour of coverage before events moved to the capitol building. 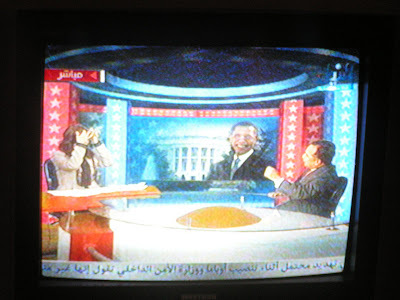 The pair of commentators filled the time with their conversation - usually in front of a split screen with the left half labeled "Washington" and the right half labeled "Cairo." 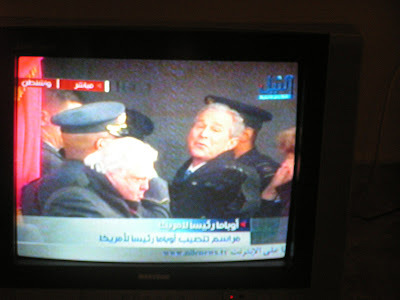 Finally we watched full screen as former presidents arrived on the scene. George Bush, "the father" as he is known by our friends here is still popular. George "double Bush" as our friends say, on the other hand, is not at all popular. And, as I've indicated before, President Obama is very popular and people here have high expectations for him. 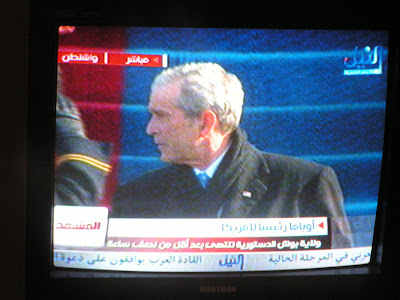 When the actual inaugration began, our commentators disappeared and we were treated to a simulataneous translation into Arabic of the speakers' words. 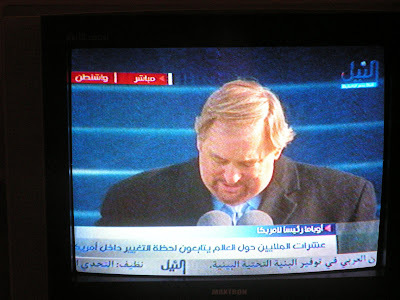 We couldn't make out much of the English being spoken but certainly recognized the Lord's Prayer when Rick Warren got to that point. I wish I spoke enough Arabic to understand that. It was clear what was happening at this point although we couldn't hear Justice Roberts flub his line. Mercifully, we didn't have to listen to that lady who was "stiching up a hem." 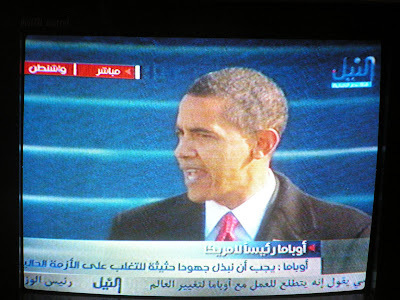 The quick look backwards from the now former president was our cue to turn off the TV. Watching an inauguration from another country makes you realize how lucky we are to live in America where transitions of power are smooth and the rest of the world cares enough to show the event live on their local stations. Numerous people asked if we saw the event so we know that they were interested. 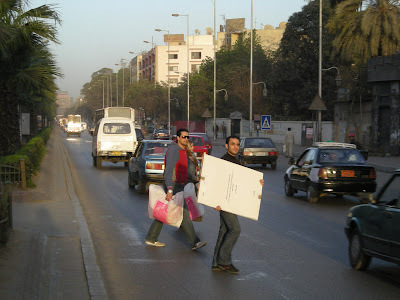 We were off to Nasr City last night to do some furniture shopping. 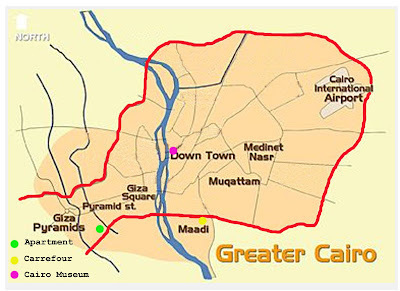 Our apartment is located about eight miles southwest of downtown Cairo and Nasr City is about ten miles due east. 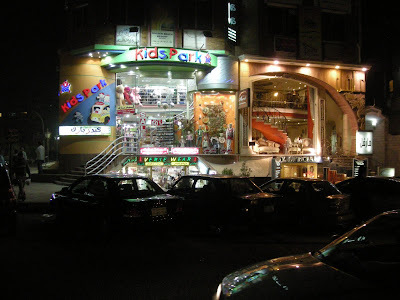 Nasr City is home to several malls and many shops. 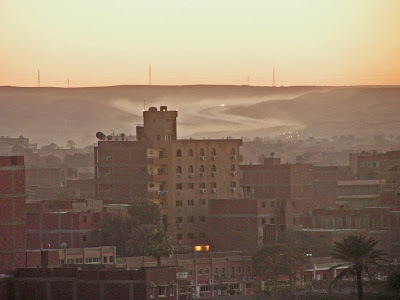 It is quite a bit more "upscale" than the area where we live, close to the Pyramids. Our friends Mona and her son, Moody, are going to help us find some quality furniture for the "salon" or living room of our place. After arriving we first head out for dinner. 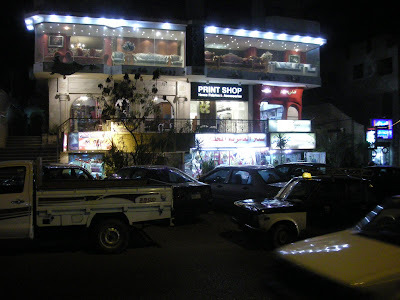 We choose the restaurant, Hosni, close to Mona's place. Hosni is known for its seafood specialties but serves a wide range of dishes. It's a three floor building with take-out on the first floor and a lot of seating on the second and third floors. 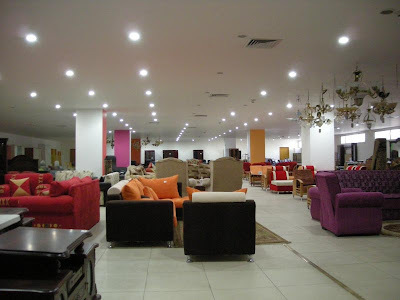 Hosni proved to have a very nice atmosphere. There are lots of customers on Friday evening and one group of fourteen or more is seated near us. 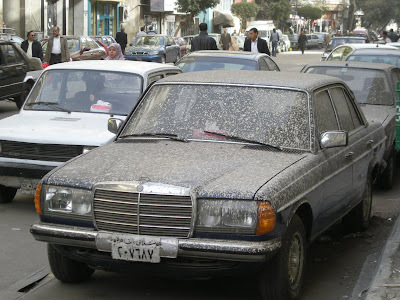 A review in Egypt today linked below describes the interior better than I can. The two-floor rectangular dining spaces are done up in more marble than I’ve seen in any single space this size. In fact, it’s the sheer amount of marble — used on every single surface from the walls, staircase and floors to the columns — and not the fresh fish display nor the glass wall running the entire length of the restaurant that first grab visitors’ attention. There is no English language on our menus we see but with our friends help we order mixed grill for me and duck for Linda. I also had the lentil soup and we shared some salads. Besides the usual hummus and baba ganoush, we had a caviar salad that was excellent. Linda's duck dish arrived as a full half duck and it was a bit difficult to cut apart. I liked the mixed grill. Hosni is not on the beaten path for tourists so it was nice to get acquainted with it. 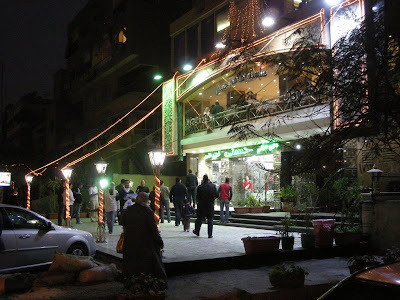 It turns out that this is a branch of the well known Hosni's Grillhouse in Alexandria as described in this review from Egypt Today. Here is another. If you don't look at the top of the picture, you could miss it. Linda had rejected the idea of traditional Egyptian furniture. Here are a couple of typical sets that you might find in any of the Omar Effendi department stores here. This resulted in us choosing something that will be custom made. We picked out a nice model for a sofa and two chairs. 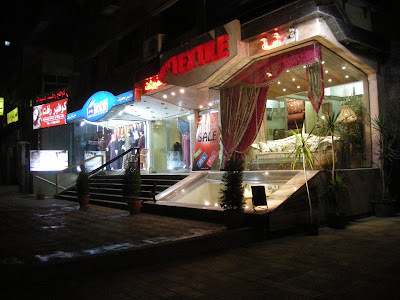 Prices are reasonable and the owner assures us that he is the "fastest in Egypt" and can build the furniture in ten days once he has fabric in hand. These appear to be top-notch funiture fabric and with Mona's negotiating help we soon have the price down to around eight or nine dollars a yard. There must be a lot of middle-man charges added in before this stuff arrives in an American living room! Internet in Egypt. Etisalat to the Rescue! We finally have a reliable Internet connection from the apartment here in Cairo. 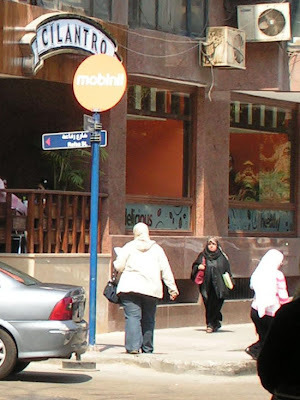 Thanks to the newest of Egypt's mobile phone suppliers, Etisalat. When we first arrived, I unpacked the computer and checked for wifi connections. Perhaps Cupid, the local shisha and tea shop might have a connectible wireless. We are not lucky enough to live right above a Cilantro restaurant where they do have wifi connectivity. Here is a picture of Cilantro from a previous visit. Note the lady in the lower right corner. In the 2nd shot, you can see that she's surfing the net. Well, sure enough, I not only found a wifi hot-spot but it even seemed to be a vendor selling their Internet access service. That name, VETO might give one pause, but I called the listed numbers. It took a while to find someone speaking a little English, but soon Muhammad and two friends were at my door. From what I could understand, Muhammad is both owner and tech support. He brought along the Marketing Department and a wire-puller. Muhammad is a recent EE graduate and has developed his own antenna to improve the range of the typical wireless access point (WAP). With three installers on the job, soon we had a WAP taped to the balcony railing and about fifty feet of Ethernet cable strung across the room to our computer. We were connected into Muhammad's Internet access point that lies about a kilometer to the east. 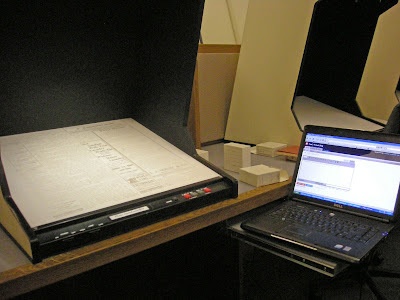 In spite of Muhammad's success in demonstrating the system and a later on-site support visit, access was poor. I ended up "pinging" the server and found that I wasn't just losing a few packets, frequently I would lose most packets. It was time to veto VETO. I stopped in at a major-league Etisalat office at the Carrefour mall (more on that later) and found a one-page English language description of their Internet service. I didn't have my passport along so couldn't sign up on the spot. 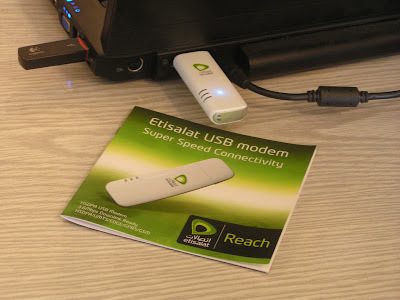 A return trip yesterday brought me a nice EVDO USB stick modem and a monthly data service plan. This was the simplest install of any Internet connection I have used. Click "yes" about four times and we were connected at 384KBPS. Not super fast but it sure beats the alternatives. And for a techie like me, I love being able to monitor the download and upload speeds on the chart. Now I just have to call Muhammad and cancel my VETO plan. He offered me a thirty-day free trial and so he will probably cheerfully refund my money and take back the equipment. I think the system might work better if he used a more directional antenna. This youtube video shows how to make one and is entertaining even for the non-techy! Muhammed called last night and wanted to drop by to work on the network. I said "now would be fine" and he and two assistants stopped by around 9:30 p.m. He was surprised to find the equipment disconnected. He just wanted to make adjustments to his customers computers because he had changed the SSID on his base router. I showed him the video linked above and he promised to build the "can antenna" and bring it back for a test. We techies just can't resist experimenting. Meanwhile, I still have the equipment and he has my money. Well, not really. I am actually sitting at the Minnesota Historical Society in St. Paul where I typically spend my Tuesday afternoons. I am doing research for a book on the history of the Polish community near Sturgeon Lake, Minnesota. This has gradually turned into a book about the nearby Moose Lake area. The publisher of the Moose Lake Star during my period of interest was one P C Peterson. He left Moose Lake in 1904 and set up a newspaper in the town of Frazee, MN. He published there for at least a dozen years before moving on to the west coast. As I look for Peterson's departure from the Frazee paper in the Historical Society records, I am struck by this story from February 27, 1914. A man, giving his name as Tom Rogers, hove into town Monday evening and requested the priviledge from Marshal Glander to sleep in the town hall that night. This request was granted and at about eight o'clock he became thirsty and espying the large carboy in which the suphuric acid is kept he tried to quench his thirst from that. He succeeded in tipping the carboy so far as to get some of the acid in his mouth, but fortunately the greater part went on the outside, burning his chin and clothers on the front of his body. His left hand was also badly burned and he evidently got some of the acid in his mouth and throat as the interior was all white when examined by the phusician. He was taken to the county infrimary on Tuesday. When leaving, the marshal informed him that as soon as he was able to he must pay for the acid that he spilled so it is safe to say the fellow will never return to Frazee. What a different time it was. No concern about a lawsuit against the town! The visitor must pay for the loss. And so many questions. What is a carboy? Easily answered. Why would a town hall keep a carboy of sulphuric acid within easy reach? Was it customary to stop at a town and ask for permission to sleep in the town hall?